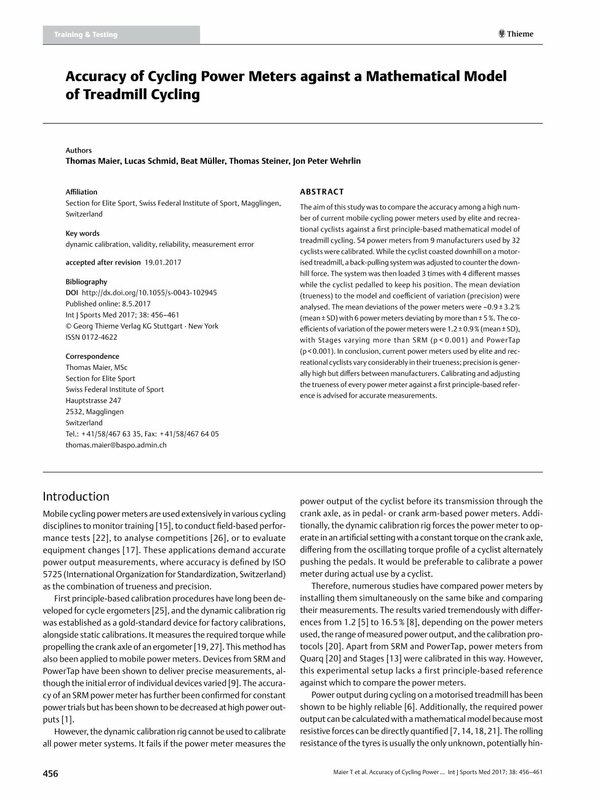 The aim of this study was to compare the accuracy among a high number of current mobile cycling power meters used by elite and recreational cyclists against a first principle-based mathematical model of treadmill cycling. 54 power meters from 9 manufacturers used by 32 cyclists were calibrated. While the cyclist coasted downhill on a motorised treadmill, a back-pulling system was adjusted to counter the downhill force. The system was then loaded 3 times with 4 different masses while the cyclist pedalled to keep his position. The mean deviation (trueness) to the model and coefficient of variation (precision) were analysed. The mean deviations of the power meters were –0.9±3.2% (mean±SD) with 6 power meters deviating by more than±5%. The coefficients of variation of the power meters were 1.2±0.9% (mean±SD), with Stages varying more than SRM (p<0.001) and PowerTap (p<0.001). In conclusion, current power meters used by elite and recreational cyclists vary considerably in their trueness; precision is generally high but differs between manufacturers. Calibrating and adjusting the trueness of every power meter against a first principle-based reference is advised for accurate measurements.